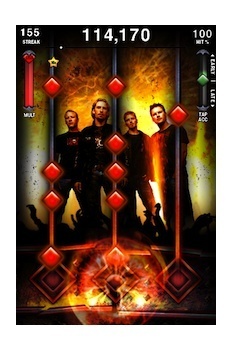 Get ready to rock out with your iPhone out in Nickelback Revenge, the new version of Tap Tap Revenge featuring the group that famously blamed music games like Guitar Hero for the decline of the classic rock-and-roll band. The release of a rhythm game for the iPhone isn't something we'd normally take notice of, but Nickelback Revenge is special. Not just because it's based on the biggest band to power out of the Canadian rock scene since Helix but because it was only a year or so ago that frontman Chad Kroeger was blaming the runaway popularity of music games for a declining interest in actually making music. "Kids: Start rock bands," he said back in November of '08. "Set down the Guitar Hero, learn how to play an actual guitar and start a band, because it's hard to find more bands to put a solid rock-and-roll package together, to get out there." But Kroeger is singing a bit of a different tune today. "The combination of our music and Tapulous' gameplay is very cool," he said. "We're excited to give our fans a fun, interactive way to experience our music." Nickelback Revenge will feature "engaging Nickelback graphics and content" along with 11 of the band's biggest hits and the opportunity to win prizes by beating the group at its own game. A Bluetooth "battle mode" also lets players duke it out in point-by-point brawls for rock superstardom. This isn't actually the band's first foray into the realm of music games; a Nickelback six-pack was released for Rock Band last week. But seeing Kroeger and co. do such a complete about-face in a press release makes Nickelback Revenge a lot more fun. This, Chad, is how I remind you of some of the stupid things you probably wish you hadn't said.